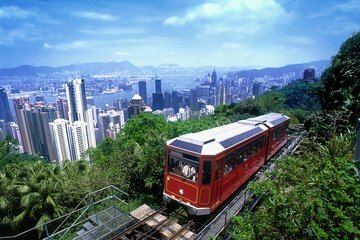 See Hong Kong in a whole new way with the Peak Tram Sky Pass, which scores you a ride on one of the world's most iconic funiculars as well as a visit to the city's Sky Terrace. Set out via tram along a steeply rising incline, traveling above the harbor while enjoying incredible panoramic views. Savor more stunning sights from atop the 1,404-foot-tall (428-meter) Sky Terrace, boasting 360-degree views―the highest in Hong Kong. You can also peruse the works of local artists at the terrace's Sky Gallery. it is a horrible experience. It is not worth to pre-purchased the ticket at all. There is no separated line for people have tickets. We still have to stand in line with people without ticket to redeem the tickets. The line is over 2 hours long, we gave up, just wasted our tickets. This is nothing to do with Viator, hope Viator can give the feedback to The Peak Tram. A must see tourist destination especially on a fine day. Unfortunately part of the Sky Terrace and some restaurants was closed due to restoration/upgrade. This site is worth visiting. It is a great way to view Hong Kong. The lines were insane before sunset. Well worth the trip.Fantastic views from the Sky terrace.